Mom didn't have a chance to work on the pictures today for two reasons. Mom came home just after my mid morning nap with Miss Jenn! One of my favorite people because she gives me OODLES of ear scratches. Miss Jenn had a sad feeling about her so I did my best to cheer her up. I gave her snuffles, nose kisses and I let her scratch my ears. I also curled up next to her for a couch cuddle. It's a tough job but somepuppy has to do it. I even went with Mom to drive Miss Jenn home! That's why we're late posting. Mom says she's just about to turn into a pumpkin. I'd better go and cuddle her asleep. A Shar Pei's work is never done. I'm having trouble loading pictures both to my Uncle Marty's website where my gallery is AND to blogger so sorry gang, no pictures today until Mom figures out what's going on. My whole post was going to revolve around a pair of pictures though, doesn't THAT just figure. Anyway, I had a good weekend. My Aunt Angela was here! Uncle Brett was no where to be found though. Sigh. She made sure to give me ear scratches from my uncle though. He sent them all the way from AUSTRALIA! What a guy! That's about it for me. Not much of a post without that picture I wanted to talk about. Maybe tomorrow. The lovely Miss Lola sent me an award! Thank you Miss Lola! 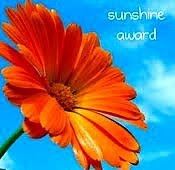 You bring Sunshine into our lives too. It's nice to know there are other Peis out there blogging. Yeah well, I don't do award rules really, I find them not inclusive enough. How could I pick only 12 blogs without excluding some of my friends? That doesn't seem right does it? So, grab it if you want it! I find all the Dog Blogs make me feel sunshiney. To keep with our sunshiney theme, here is the picture I was thinking of posting for Find the Pei Friday. It kind of involves sunshine. Can you see me? Well, I WAS going to do another Find The Pei Friday but then Mom and Grandma and Grandad came home from Mall Crawling with Puppy and a big box. As an aside, I want to go Mall Crawling, it sounds fun. I'm lower to the ground, I should be awesome at it. OK, sorry, got distracted. So Mom and Grandad put this thing together and stuck Puppy into it. It turned him into a funny eyed Puppy - look! I went to my Grandad for comfort. It's a good thing he was there. Look at these ear scratches. Sigh. Come back soon Grandad! Hey! Look at this! Mom's helping me blog again! Nose kisses for her! It seems she has more timein the evenings, so I'm like WOAH! I can blog in the evenings! That's doable. Anyway, Everyone wanted to know what I was looking at out the window yesterday. It was a squirrel. Mom was a little slow with the camera and it was out of sight when she pressed the shutter. Sigh. Trust me, it was a squirrel. Anyway, I had to watch over Puppy this afternoon. This picture isn't from today, but you get the idea of what I have to do right? I mean, Puppy is in his kennel, why should I have to watch him in there? I'd much rather look out the window. YAWN! Although, if he's in there, that means Mom's hands are free for ear scratches. Mmmm, ear scratches. Look at this! Two posts this week! Mom's doing pretty good. She needs a nose kiss apparently. 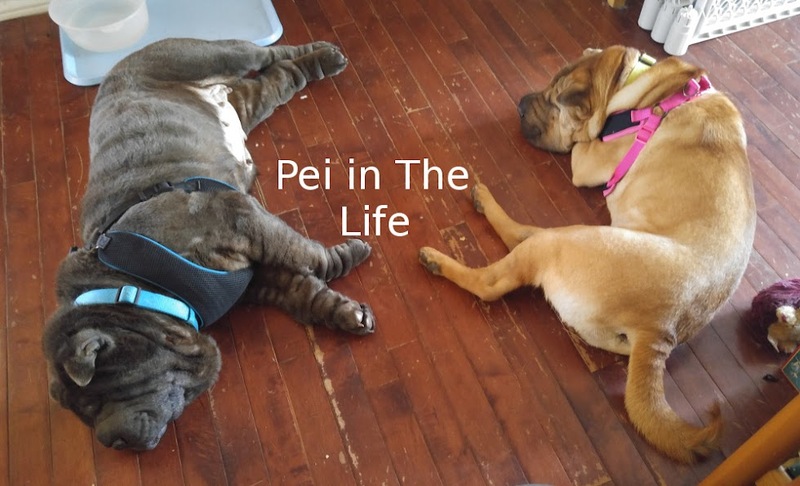 Anyway, I had an exhausti-pei-ting time yesterday at day care. It was really nice to come home and make sure my people knew that I missed them. Day Care is all well and good - and I got A LOT of back scratches - but it's always nice to come home to your family. Don't you think? Mom says I have a big job to do today. Grandma and Grandad are coming over to "Babysit" Puppy. I'm going to need to snoopervise that! Maybe I can interest Grandad in a came of rope too. I've got to go find my rope! Oh, wait, I'm ready for you Grandma and Grandad! You can show up anytime! Mom is packing the laptop and my lunch box! You know what that means! DAY CARE FOR BOLO! WOHOOOO! They love me there. I'll snuffle through everyone's blog during the day - when I'm not snoopervising the staff. Mom says I have to be quick because Puppy is needing her attention. I've been going on Rescue Dad Missions most of the week. Isn't that GREAT!?!?! Except for today, Dad has the car. Mom says Grandma and Grandad are popping by so maybe I can rescue them! Pei-Ess - Look at that, 3 posts this week! 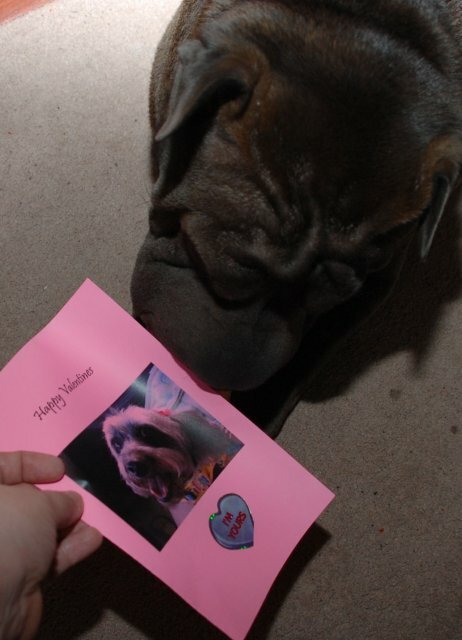 Mom just woke me up early to tell me that there is a new Shar Pei Blog! Well, that's worth waking up for! That's Shih Kwan. Excuse the blurriness, Mom didn't have the best camera at the time. Anyway, welcome Lola! I'm sure you'll get lots of fans now, there are a LOT of Shar Pei fans out there. I'm pretty sure it's the nose. We have the best noses out there, IMHO. I will leave you with a picture of ME. Just so you don't forget what I look like. Hey all, it's been a busy day, I'm at Day Care with the laptop and can finally write! Phew, they certainly keep us busy here. Seeing as I'm the Snooperviser of the World Since it was Flat, I have to keep an eye on what all the caretakers are doing. It's March Break here and Mom says the children are out of school, which means that the PetsHotel is FULL! I'm glad Mom called ahead for me. Although I've been assure that I can be squeezed in anywhere. Like a giant HUG! Pei laughter. Not much else new, oh, yeah, bath yesterday. Yuck. I tried to escape but Dad was on me too fast. Sigh. Mom says I smell WONDERFUL. Uh hunh. Yeah sure, whatever. OK, I'd better catch a nap before my afternoon play and cuddle session. Well, there aren't any pictures, but that's because Mom had her hands full with my leash in one hand and Puppy in the other. We were having NOSEVENTURES! The Noseventures started on Saturday with 2 - count em! TWO - walkies with Dad and Puppy, then another one on Sunday! WOW, that means it was a GREAT weekend. BUT, hang on to your noses my friends, it gets BETTER. Monday was my Play Date with the ladies and gents at the PetsHotel! But first, I had to drive Daddy to work. It wasn't his regular work, he went somewhere else, and I had to help get him there. It's a tough job isn't it? Tuesday - that's today - I had to drive Daddy to his other work place and then we went off for the Noseventure! It was a long way off, so I tried to sleep, but it's tough to get comfy with Puppy's backseat kennel in the way. I did manage a bit of a snooze though. Then finally we were there! I recognized the house, we were there at Christmas. This is were my little human cousins live. It was nice to see them. I made sure to snuffle Littlest Cousin (she's just a little bigger than Puppy); Middle Cousin (bigger than Puppy); and Big Cousin (Lots bigger than Puppy). (Mom here, LC is 15 months, MC is 4yrs and BC is 6yrs). Thank you for the clarification Mom. Oh, I also snuffled Auntie. She needed it. I could tell. I had a HUGE nap when we came back home. Then I had to go and RESCUE DADDY! I haven't had a chance to do that in SOOOOO LONG. It was a good day. Would have been better with pictures, but you know, Mom was busy. Yeah, here I am. Finally getting a chance to blog, it's been FOREVER. I'm blaming Puppy. He's taking up too much of Mom's time. At least she's got him his own kennel now (MOM: Playpen) Kennel Mom, it's a kennel. At least that gets him off my floor. I'd better start with an update on what's been going here. 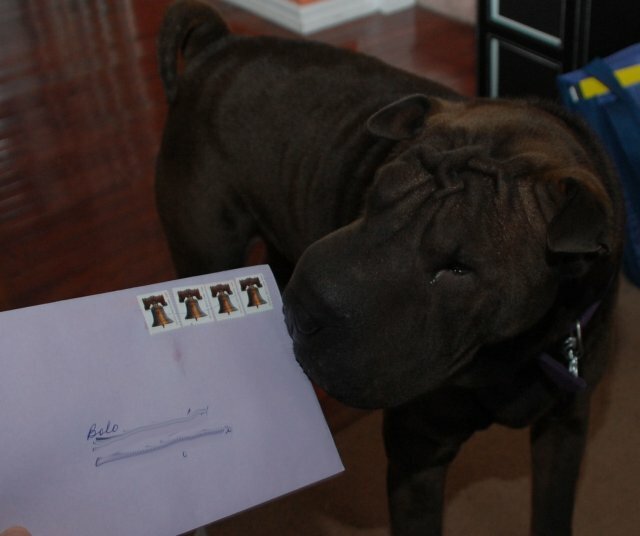 First of all, I got mail LAST WEEK (Mom is slacking off with the pictures AGAIN). Kisses right back at ya Ms. Mona. In other news, Grandma and Grandad have been coming over quite a bit. Grandad is really good about playing rope with me. I've trained him well. We even went for a walk together - Mom, Grandma, Grandad, Puppy and I. That was yesterday. Today, Grandma and Grandad only took Puppy. Although Mom did take me out for a little noseventure, it wasn't enough. And Puppy is stealing my thunder. He took Grandma and Grandad to the mailbox to mail Aunt Sharon's Birthday Card. That's usually MY JOB. Sniff. Now Dad has gone out WITHOUT ME! But he took Puppy. Sigh. It's a good thing Mom loves me. That's my news, I hope Mom lets me write again soon. I'm heading to 500 posts. Any ideas what I can do to celebrate that?